Dr. Naidu has excellent conceptualization and communication skills. He has a professional experience of around 16 years in the industry and academics. He stands out as a role model to many of our students with his expertise and knowledge. 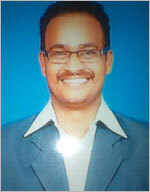 Dr. Naidu has done his Masters’ in Business Administration and also has a Doctorate Degree in Business Administration. His career accomplishments include: ‘The Most Valuable Player Award’ for Performance Excellence from Infosys Technologies Limited. He has the industry experience with organizations such as City Bank Group, Infosys Technologies Ltd., and HSBC. He also has academic experience with various prestigious educational institutions. He has been teaching Human Resource Management, Compensation Management, Strategic Human Resources and Human Behavior.